Isle of Wight Camping is one of the best ways to experience the Island, and to make things easier for you, we have compiled a wide selection of camping and caravan accommodation for you to choose from. With over half the Island designated an Area of Outstanding Natural Beauty, it's an ideal place to get close to nature. For quiet relaxation there are country camping sites, where you'll find a choice of footpaths leading through fields, farms and woods. Some Isle of Wight campsites have fishing lakes and others adjoin farms, where there are friendly farm animals for the children to meet. Appuldurcombe Gardens Holiday Park has a range of great features and facilities and is situated next to a tranquil meadow, perfect for taking the dog for a walk and exploring the Island's countryside. The Orchards Holiday Caravan and Camping Park is based in Newbridge, just a short car journey from Newport and Yarmouth - as well as a bus route connecting the site to the rest of the Island. The Orchards was awarded the Practical Caravan and Practical Motorhome "Best site for Families" for 2017. Some of the best deals to stay on the Isle of Wight, are when you book the ferry with your accommodation. Have a look at our ferry inclusive accommodation page to find out more. If you prefer a few more home comforts why not opt for 'glamping' in a yurt, complete with woodburning stove and shower room. If you prefer a livelier holiday, many caravan and camping sites are within easy reach of the main resort towns and beaches and some are part of a larger holiday park complex, where campers can enjoy the benefits of additional facilities. If you are searching for somewhere to pitch your tent during your Isle of Wight holiday or short break, then look no further. Below you can browse a list of a range of all the campsites and holiday parks on the Island that have camping pitches available - for further information on tariffs and facilities click the individual listings. Touring caravans have always been a very popular choice of holiday in the UK, and the Isle of Wight's long standing history as a holiday destination means we have a number of well established caravan parks with excellent facilities. Hook up electricity, water points and hard standing pitches are offered at many of the campsites and holiday parks across the Island. Over the past few years holidaymakers across the globe have been going crazy for glamorous camping – aka – ‘glamping’. 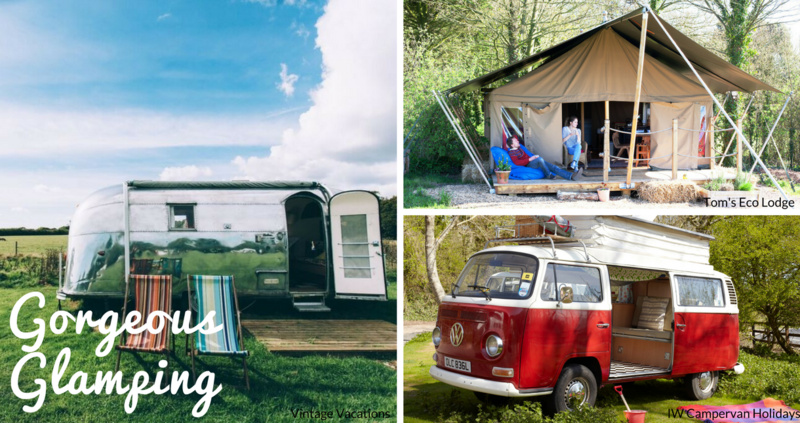 Glamping is the perfect camping alternative and offers those looking to relax and enjoy the great outdoors a base that’s more of a home from home, rather than a simple tent with a groundsheet and sleeping bags. There are many glamping sites on the Isle of Wight which offer a huge range of alternatives to standard tents including yurts (circular tents which originate from Eastern Europe), safari tents, eco pods and cabins. If you’re looking for something really quirky, try a week in a beautifully decorated vintage airstream trailer or a weekend out and about exploring the landscape in a VW camper rental. Many of the yurts, safari tents and other static types of glamping come with wooden flooring, heating, sofas, double beds and other items you wouldn’t want to sacrifice on a normal camping trip. Tom's Eco Lodge, one of the Island's largest glamping providers, offers a range of high quality safari tents and cabins – whilst you're there be sure to pay a visit to the very free range, ex-battery chickens to see if they've laid you some eggs for breakfast! And Glamping the Wight Way offers a unique way to stay, overlooking the River Yar - offering the perfect escape to help you unwind. Thinking of coming over for one of the Isle of Wight’s major music festivals? The Isle of Wight Festival glamping site sits away from the masses of standard camping tents and provide an element of luxury for music lovers. From pods to tipis, choose your very own glamping pitch to make your musical pilgrimage a little more luxurious. Head back to the yurt, safari tent or tipi and relax and unwind after an exhausting day of exploring and partying. The Park offers beautiful downland views in a countryside setting. Within two miles are the sandy beaches of Sandown and Shanklin. Award winning friendly family run campsite set in the picturesque woodland of Whitefield Forest. Family run camping park in picturesque rural setting close to the beaches and rolling downland.